After years of motorsports inactivity, Acura is making a big push to gain race wins for the brand in IMSA GT Daytona class competition. In their first year of combat in this very tough class, the new Acura NSX posted back-to-back wins in the hands of Andy Lally and Katherine Legg. In the course of a test year, I drive almost all the mid-price SUVs. For the most part, they make little long lasting impression. Acura’s MDX, however, breaks the mold of boring conformity. This is without doubt the company’s best model, which also explains why it’s their best selling SUV. In 2014, Acura brought an all new MDX to the mid-size SUV market segment. Since then, this entry, which remains unchanged for 2016, has become the all time top selling SUV with three rows of seating. In practice, this stretched Acura looks and behaves more like a minivan than a sports utility vehicle. This new model represents an amalgamation of two previous Acura models, the TL and the TSX. The TL was Acura’s affordable techno deluxe sedan, while the TSX represented entry level Acura ownership in a sporty package. The new TLX does a good job of combining all those virtues in one unit. 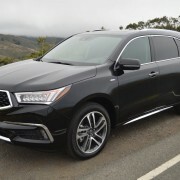 The latest 2014 RDX builds on the positive changes accomplished for 2013, when Acura redid the RDX by installing a 3.5 liter V-6 instead of the previous version’s 2.5 liter turbocharged inline 4. This engine compartment transplant makes a compelling case for giving the formerly underpowered RDX another look. The base model V-6 of our test car is good for 20 MPG around town, and 31 MPG on the freeway. One of the most rewarding aspects of Acura ownership is Acura Total Luxury Care (ATLC), which provides you and your RLX with a personalized home page that covers accessories, model specifications, current Acura Financial Services billing, and email reminder notices for service. Since the demise of the ground-breaking NSX sports car and the discontinuation of the razor sharp Integra Type R, Acura has become an invisible brand to enthusiasts. 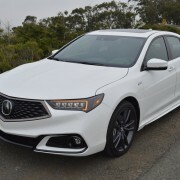 But for 2012, the luxury division of Honda has introduced a sports-flavored Special Edition version of their most affordable TSX sedan that will have erstwhile marque supporters rallying for a closer look. The TSX SE is Acura’s best shot at a sports sedan. Unlike any other product in the company’s extensive line, this one is available with a manual transmission 6-speed. The sea of mid/large-sized luxury sedans has grown over the years, primarily because this is still a lucrative class of automobiles for manufacturers. Minutes before the much anticipated debut of the Chevy Camaro Z28, it was all over Twitter that the car revealed would actually be a ZL1.